Hello! I'm joining Hero Arts for the release of their 2017 Summer Catalog in the Hero Arts online store! You should have made it here by way of my friend Ilina Crouse. If you didn't, be sure to head over the Hero Arts blog to start at the very beginning! Today I'm sharing a few of the projects I created for the catalog. I love all of the rainbows, unicorns and other fantastic beasts in this release! There's so much fun stuff! First the tags - I die cut them using the Infinity Tag dies out of watercolor paper. I used a combination of stamps - two great woodblocks Unicorn and the message Something Magical. I also used the message from the Unicorn Stamp & Cut set. The images were embossed in gold, and then watercolored with my Daniel Smith dot palette. I added some strips of gold glitter paper to the unicorn tag, and also die cut some teeny little hearts with the tiniest heart die from the Heart Infinity dies set. I finished the rainbow tag with some gold shimmer spray splatters. I also made a full sized card, very similar to the tag - just a watercolored rainbow on watercolor paper, and then the Something Magical message embossed in gold. I'm the last stop on the blog hop today, but I encourage you to visit all of these fabulous bloggers! Hero Arts will be giving away three $25 shopping sprees, drawn from comments left across all blogs in the hop. Please comment by Wednesday, 5/24 at 11:59pm PT and the winner will be announced the following week. Thanks for the color inspiration. Beautiful rainbow! Looks like it was a fun one to make! Gorgeous! Love all the rainbow watercoloring! Gorgeous rainbows that show off the messages and unicorn! Rainbows and Unicorns...a perfect combination! I just love your rainbow colors, especially in the mane of the unicorn! Love your fabulous, magical cards and tag. Such fun colors! Beautiful and colorful cards and tag. Love the rainbows. What a beautiful rainbow of colors and cards. There is something about a rainbow unicorn that is just magical! Beautiful card and tag. Nothing better than unicorns and rainbows magical and dreamy the way you made them jist beautiful. Love the use of rainbow coloring with the rainbow! So pretty. Love how you colored the Unicorn. Thanks for sharing! Love all the gold sparkle!!! great cards! Anything with unicorns and rainbows is good in my book! I just love the pop of gold sparkle too! Loving the rainbow colors paired with gold sparkle. Love the rainbow hair on the unicorn! WOW Libby, you ladies are killing me here! Tags, glitter and lots of colour are my weakness and these are all just fantastic! Very well done! Lots of pretty rainbow colors!! Love them all. Great designs to showcase the new release! Love the unicorn stamps and coordinating dies but the background is beautiful!! PRETTY! Your watercoloring on these cards just made me want to RUN to my craft studio and watercolor, play, create! :) Thanks for sharing and being part of such a fun blog hop. Super sweet and cute! Thanks so much for the inspiration! Love the rainbow effect here. Love the fun and rainbow colours you used! These are spectacular, love the rainbow of color, especially what you did to the unicorn. Lovely looking tags & card with the saying and adorable Unicorn with those colors you did for the background..
Love these tags. The rainbow colors look gorgeous. I love the unicorn. So adorable. The colors are bright and cheery, I love them. The unicorn is so adorable. I don't know who would like it more- me or my 3yr old daughter! Perfection! Very pretty, I especially like the mane and tail on the unicorn. She is so cute. So pretty! I love the gold and the rainbow. Thanks for sharing! Rainbow perfection! Love the set you created and the gold embossing - stunning!!! Outstanding you are something magical bookmark / tag. It makes me smile. I'm big fan of rainbow colors; probably my favorite color combo. All of your cards are just lovely! Amazing watercoloring--perfect to showcase the new stamps. Fabulous cards and tags!! Awww, rainbows always make me smile! Rainbows and unicorns, what more can you ask for? Thanks for sharing! Love the rainbow coloring. Great cards. Cuteness! These are really cute and fun! Love the colors you used. Thank you for sharing your cards for inspiration! The gold on these really sets them apart. Great work. Love the tags. The gold makes the other colours pop. Thank you. Love the cards and rainbows. The tag is awesome. Love your cards so fun! Beautiful unicorn, love colourful cards. Rainbows, gold and a unicorn--the trifecta of girly card heaven! Love the card and the tag! Especially the rainbow colouring!! TFS!! Very colorful card and tag. Loving all these rainbows! So sweet! Love your rainbow collection of ideas. Seems like we are at the end of the blog hop, and the rainbow. This was a great blog hop with lots of inspiration, fun and color. Thanks to Hero Arts and everyone for all the great ideas! Really cute tags! Love the colors. Love that unicorn!! So clever! Beautiful rainbow colors on your cards. The unicorn does look magical! So pretty! I love the way the unicorn looks. Beautiful rainbows!! Thanks for sharing! Your tags are lovely. The unicorn is truly magical. I love rainbow cards. Thanks for sharing your talent. That unicorn is amazing. Loving the rainbow colors. I love the rainbow tag! Rainbows of color and three fine projects are done. Thanks so much for your designs. Loved them. Love your watercolored tag to match the unicorn! The sentiment looks amazing in gold! Love your rainbow unicorn - it makes her look more magical! Love your water coloring and the unicorn. Beautiful. Pretty card and tags! Love the rainbows! Beautiful unicorn card. Love the bright colors. This would look great in a journal as a page marker. We always need to be reminded of how wonderful we are. So pretty! Love the gradient rainbow! I love the watercoloring. That tag is great. It could be mounted on a plain card as is too! Thanks for sharing! I will always love playing with rainbows and paint! Thanks so much. I'm loving your beautiful rainbows! Fabulous and colorful projects. Love the gold too. I love the wonderful colors you used on your creations! Thanks for sharing. Your tags are magical! I'd consider these to be gifts in and of themselves! Gorgeous! the mane and tail of the unicorn. The rainbow is so pretty. Who doesn't love rainbows? The gold unicorn is just perfect! Rainbows and unicorns. A perfect match. That's such a fun rainbow! Thanks for the ideas. I love the watercolours. The rainbow and the sentiment are perfect together. Beautiful! Pretty and fun, love the whimsical feel! What beautiful work.. The colours are amazing. Thanks for the great inspiration. Awesome creations. I like the colors you chose. I love the rainbows on your cards! You have to love rainbow color! Beautiful rainbow unicorn. The gold embossing is a pretty touch. I love all the rainbow watercolors! The gold embossing is beautiful, especially on the unicorn!! Your rainbow unicorn tag is gorgeous. I love the gold accents! Love the happy colors. Thank you for sharing. I love how you created these rainbows. The tags and card look wonderful with the rainbow and gold combination. These are beautiful, Libby! Love those rainbow colors! I love how you used the rainbow colors!!! 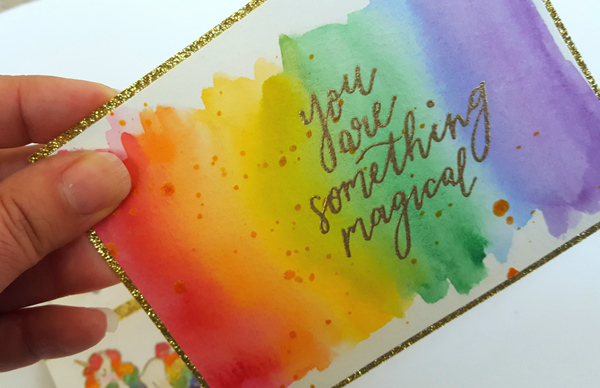 I especially love your card with the gold embossing around the edges, the beautiful watercoloring of the rainbow and the perfect sentiment! Love the rainbow and gold combination! Love the watercolored mane on the unicorn! Wow Libby these are gorgeous! Love the rainbow colors! Beautiful cards! Loving the rainbows and unicorn stamp and sentiment. These are going to be very popular! Thanks for the inspiration! Oh I love the rainbow look on the tag and card. Esp the gold edging on she put on the card. Lovely! I love the water coloured rainbow backgrounds but even more I love the rainbow hair of the unicorn. You did a beautiful job of it!! You can never go wrong with rainbows and unicorns!! Who doesn't love a rainbow of colors! Soooo pretty! Love the unicorn's mane and tail in those colors as well! Always sad when I get to the end of a fantastic blog hop like this one. This Hero Arts release is amazing! So much talent and inspiration! Thanks for sharing yours! I am pretty to this wonderful stamping world, love seeing and learning all the neat techniques! Love your work! Your watercoloring is beautiful and inspiring! Love the bright colors with gold. That sentiment is awesome and so are the tags! Love the whimsical feel of these awesome tags! Pretty colors and gold always make me happy! Add a Unicorn 🦄 and I just might do a happy dance! TFS! Beautiful projects, love the rainbow water color with gold! Beautiful - adore the rainbow color scheme you used. Your unicorn looks amazing w/ the embossing and the watercoloring. Beautiful card & tag Libby! I love the rainbow and that unicorn is just too cute! So very colorful! I love the touches of gold you added. Thanks for all your rainbow inspired creations. Great tags! I like the gold embossing. Beautiful tags, thank you for sharing with us! 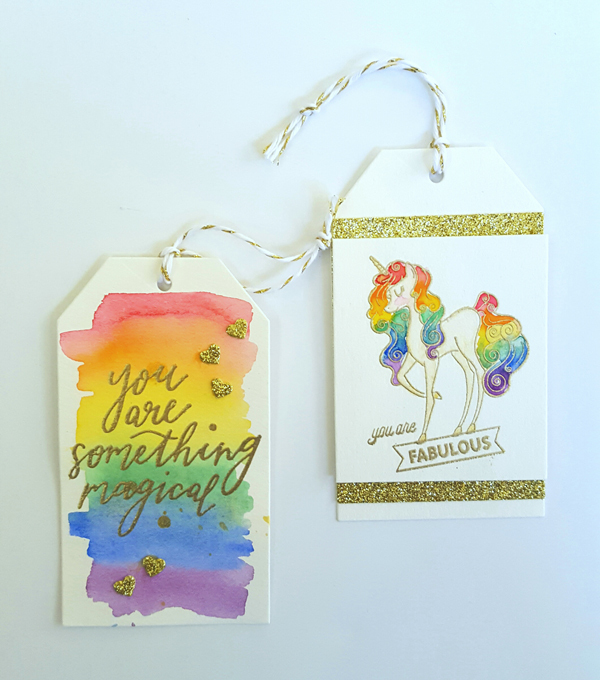 Love the watercolored rainbow tag and the gorgeous unicorn. Great job! I would sit and stare at rainbows all day every day if I could!! Gorgeous creations Libby!! I love rainbows! Unicorns too! 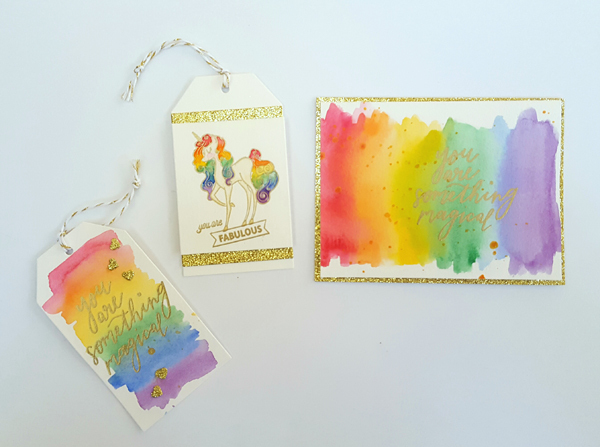 Gorgeous rainbow watercoloring on your card and tags, Libby! What beautiful tags and cards! Just so vibrant and magical, thanks so much for sharing! Love the rainbow effect on the card and tags. I like the way you made your unicorn card. AWESOME cards, they are all gorgeous! Great release!